Tragedy Comes To A Small Church In A Small Town : The Two-Way Sunday's shooting marks a profound loss in a place where everyone knows everyone. About half of those killed at the First Baptist Church in Sutherland Springs were children. Pastor Frank Pomeroy and his wife Sherri near the First Baptist Church on Monday in Sutherland Springs, Texas. 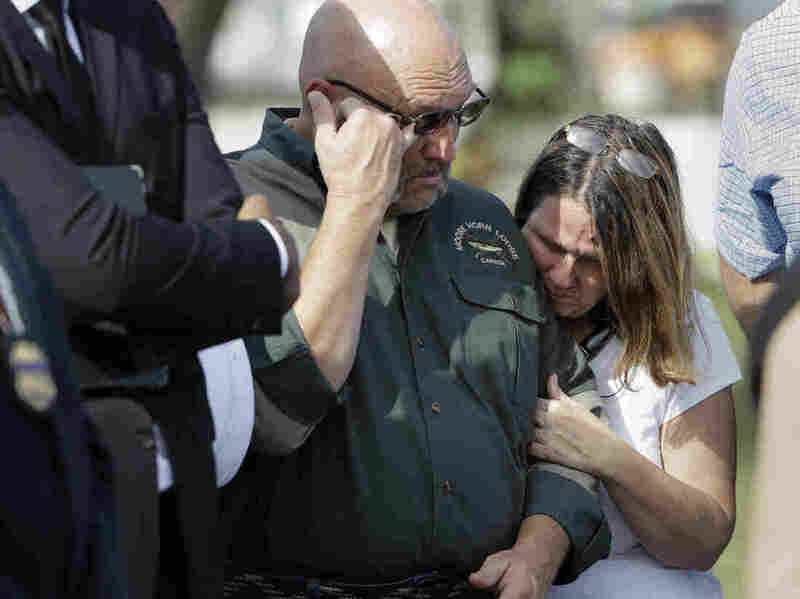 A gunman opened fire inside the church on Sunday, killing at least 26 people, including the Pomeroys' daughter, Annabelle. Sutherland Springs, Texas, is a small town. "They say the population is 400 and that's if you count every dog, cat and armadillo," 75-year-old L.G. Moore told The Associated Press. "It's more like 200 people." He runs an RV park a quarter mile from the First Baptist Church of Sutherland Springs. On Sunday, that church was the site of bloodshed and terror unleashed by 26-year-old Devin Patrick Kelley of New Braunfels. Dressed all in black and wearing body armor, Kelley stopped at the town's Valero gas station. Then he drove up to the church and began firing. He fired shots at the church building and shot two people standing outside. Then he went into the church and walked down the center aisle, shooting the worshippers who had gathered for Sunday services. Then he turned around and kept shooting. He killed at least 26 people and wounded some 20 others. It would be a horrific encounter in any place. But in this place, tiny Sutherland Springs, the event marks a profound loss. The town, 35 miles southeast of San Antonio, has one blinking traffic light. There's a post office, a Family Dollar, a community center. And the First Baptist Church, a modest white building. It's a focal point of town life, with a children's choir, a youth group, movie nights, and men's and women's bible study. Thursdays mean a home-cooked fellowship dinner and distributing food to those in need. "Everyone that goes here knows everybody," Nick Uhlig told the San Antonio Express-News. "You'd never think something like this would happen out here — it's so small." Uhlig's cousin, Crystal Holcombe, was eight months pregnant when she was killed on Sunday. Three of her five children were also killed. He said his family has lived in the area for three generations. "Everybody can come, it doesn't matter what religion you are," Uhlig said. "Just about everything a church can do, we do." Mackenzie Hanner, 18, has gone to the church all her life. She intended to go to church on Sunday, she told USA Today, but she overslept. "I see everyone there as my family, so it feels like I lost family," Hanner told the newspaper. Sunday evening and Monday morning, journalists from around the world traveled to Sutherland Springs to report on the terrible events. It's a place that doesn't usually get a lot of notice. The town's heyday was more than a hundred years ago, when the Hotel Sutherland attracted far-flung visitors to bathe in its large sulphur pool. Sutherland Springs advertised itself as "a resort town of great possibilities" and the "most beautiful spot in Texas." But a catastrophic flood in 1913 destroyed the pools and bathing pavilion, and despite efforts to rebuild, the town's tourism economy never recovered. 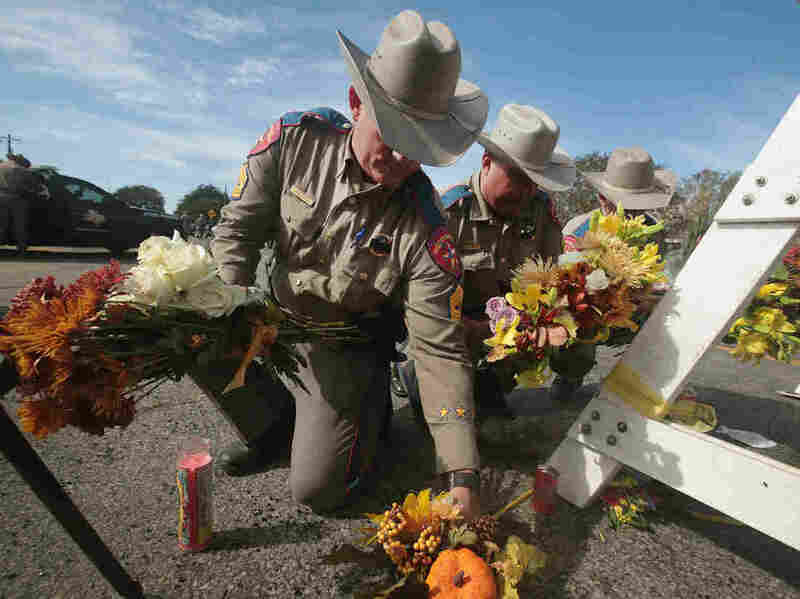 Police move flowers placed at a barricade near the First Baptist Church of Sutherland Springs on Monday in Sutherland Springs, Texas. Mike Clements is the pastor of a Baptist church in nearby Floresville, the county seat. "[The church members] don't have a lot of money, but they are always willing to give," Clements told CNN. "These people are merciful people. A lot of them will be forgiving with what happened." At a news conference Monday, police said that the gunman had sent threatening messages to his mother-in-law, who sometimes attended the church but was not there on Sunday. Wilson County Sheriff Joe Tackitt said that virtually everyone in the community was affected by the events, and that there was no way for those in the church to escape unscathed, CNN reports. Tackitt told NBC News that 12 to 14 of the dead were children. One of those killed was the pastor's daughter, Annabelle Pomeroy; her parents were out of town when the shooting happened. Her mother, Sherri Pomeroy, read a statement to reporters on Monday. "Our church was not comprised of members or parishioners. We were a very close family. We ate together, we laughed together, we cried together, and we worshipped together," said Pomeroy. "Now most of our church family is gone, our building is probably beyond repair. And the few of us that are left behind lost tragically yesterday. As senseless as this tragedy was, our sweet Belle would not have been able to deal with losing so much family yesterday." "Please don't forget Sutherland Springs," she said.